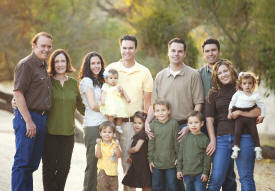 Mary’s Free-Range Turkeys is proud to be family owned and operated since 1954. Mary's sons, David & Ben Pitman, are the third-generation farmers who leads the company today. David and Ben have been taught by their father, Rick, who learned from his father, Don, about the importance of animal husbandry and our responsibility to protect the welfare of animals. Mary's Free-Range turkeys are raised on healthful grains and allowed to roam in areas four times the size of areas provided by the average commercial turkey ranch. Their high-protein diet provides the optimal amount of nutrients for the turkey to grow into bigger and more flavorful turkeys than those typically found at the supermarket. 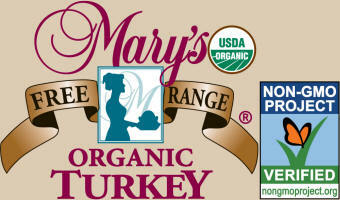 Mary's Free-Range Heritage turkeys are based on the first breed of turkeys that existed in the United States. They breed naturally as well as run and fly! These extra activities result in larger thigh meat and slightly less breast meat than found on a typical turkey. All of these traits result in a superior tasting turkey that takes less time to cook than a regular turkey! With the first juicy, satisfying bite of a Mary's Free-Range Turkey, you'll know that this bird is something special–natural, plump, and tasty–that’s a Mary’s Free-Range Turkey! The Pitman family has raised turkeys for the Thanksgiving holiday since 1954. Today, with more and more companies introducing "free-range" products, we want every consumer to experience the difference Mary's offers. To do that, we've focused on quality, not quantity. Mary's perfect Free-Range birds begin life on a farm. At our farm, roam means lots of room. Every bird grows naturally with plenty of open space to grow healthfully in a caring environment. The Pitman family has built its reputation by growing fewer but superior Free-Range turkeys year after year. A key reason Mary's Free-Range Turkeys offer superior taste is the high protein diet complete with the finest grains and vegetable proteins that provide just the right amount of nutrients for our turkeys to grow bigger and develop better than birds you'll find at the supermarket. And you won't find antibiotics, animal by-products, hormones, preservatives, or additives in a Mary's Free-Range Turkey. Instead, when you purchase a fresh, home-grown Mary's Free-Range Turkey, prepare yourself for a dining experience that you and your family will remember forever.